In 2018, we published our own magazine dedicated to Pinot Palooza and all things pinot noir. Our first edition (with a 20k circ), was distributed to attendees in all cities (with the exception of Tokyo and Perth) giving it an estimated readership of 75k. To put those figures in context, we managed the same readership as Gourmet Traveller Wine for our first ever issue. It was even a finalist in the Wine Communicators of Australia Awards for Best Wine Publication (consumer). Bam! In 2019, we’ll be doubling down and diving even deeper into your wine stories to share in print and all across our digital channels (and in multiple languages!). With an increased circulation of 40k, we’ll distribute to Pinot Palooza attendees, those at all our other events (MOULD, Game of Rhones, Gauchito Gil’s Malbec Day, etc) plus winery cellar doors and fine wine retailers. Circulation will continue to grow as we expand to other cities and countries such as the USA, South Korea, Germany, mainland China and more. Below, you’ll find the welcome letter from REVEL director and founder Dan Sims that was printed inside edition #1, explaining more about why the magazine came about and what you can expect inside. You’ll also find the complete digital version of edition #1. We’re currently working on edition #2, which is set to be published in May 2019. Unique in the world of wine, 60% of our attendees are female and 60% are under the age of 35 (with the percentage of women in this demographic increasing to up to 65% in some cities). They’re heavy social media users who engage with us five times (at minimum) during the campaign. Epic. They work in white-collar industries like legal services, the arts, entertainment and media, finance, social sciences and management and have high disposable incomes, spending a combined $2.5 million+ on event days in 2018. They’re food and wine lovers, decision makers and influencers, and make a point of seeking us out and engaging with us and the wineries who exhibit. We have worked with over 500 wineries, importers and distributors since REVEL’s inception and engage with the wine industry on a broad and social scale. Whether it be a winery cellar door, restaurant or cafe, our trade audience are integral in helping us spread the pinot word. 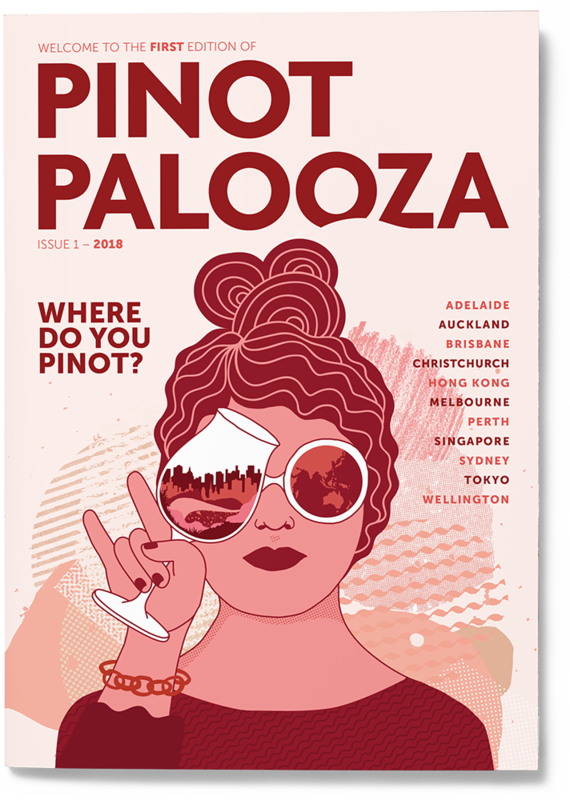 Welcome to the first ever edition of the Pinot Palooza Magazine! If you’d asked me at our inaugural event back in 2012 whether we’d one day publish a magazine, I probably would have stared at you blankly or just laughed in your face. But fast forward to today and, well, here we are. In 2018, we’re heading to 11 cities in five countries. This is an incredible testament to all of you who’ve joined us over the years, and the wineries and exhibitors who make this event possible. Because of Pinot Palooza, we’ve managed to form wonderful connections all over the world. This magazine is a celebration of those connections, as well as a token of our thanks. It’s why the theme of this edition is ‘WHERE DO YOU PINOT?’ For us, Pinot Noir is more than just a wine. It’s part of our lives. It’s with us when we socialise, travel, eat. No matter where we are in the world, Pinot is there too. This magazine isn’t about points or star ratings or using big words that no one understands (Andrea Frost’s article summarises exactly why we love it! ), it’s about helping you integrate Pinot into your life, as well as giving you practical tools to further explore it if you wish. In this issue, we speak to the People’s Choice winners from 2017 (an excellent reminder to vote for your favourite this year!). We chat to a few incredible sommeliers who share their tips on those Pinot artists to watch in 2018. We show you around Singapore, and take you on a whirlwind 48-hour tour of the Mornington Peninsula. Drinks writer Mike Bennie talks about baller wines. We speak to SOUNDS AUSTRALIA’s Glenn Dickie about the links he sees between music and wine. We chat to the incredible chef Analiese Gregory about her move from Sydney to the pristine state of Tasmania. And there’s a quick Q&A with Alice Oehr, who designed and illustrated this magazine’s awesome cover. So, a fair bit in this first edition! Our intent with this magazine is to further the conversation around Pinot and the people behind it. So we’re dedicating this first edition to all of you who have joined us and supported us at our events over the years; especially the incredible wineries who come together collaboratively every year (the 260+ wineries are listed in the back of this mag). We couldn’t do what we do without them or you. So, on behalf of Team REVEL, I’d like to say THANK YOU. Thank you for being here today and for taking the time to read this publication. I’d also like to thank my team, both present and past, who do do not flinch nor falter. They are legends and I am incredibly grateful.